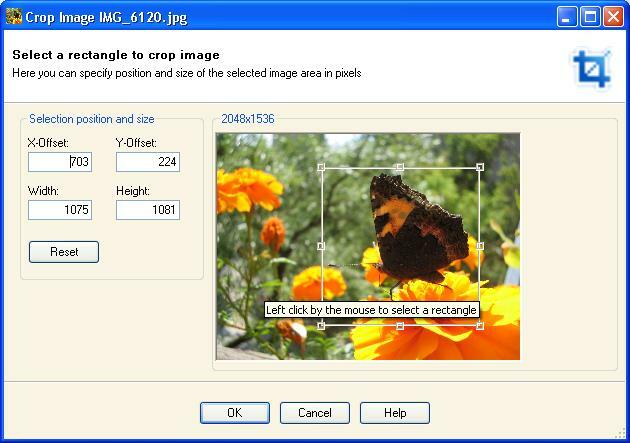 This topic provides a description of the controls on the Crop Image dialog. To crop opened image click Crop a frame... menu item from the Tools menu. You can set the position and the size of the selected image area in pixels entering values. You can also create a custom selection with mouse. Put the mouse cursor at one corner of the area you want to outline. Press the left button and hold it - mouse pointer is a crosshair. Drag the mouse across and down (or up) to the opposite corner of the area you want outlined. A border appears as you drag the mouse. Release the button when you are done dragging. To resize the outline rectangle press SHIFT key, put the mouse over the border line of the side you want modify and press the left mouse button. The mouse pointer changes to a thin double arrow. Hold left mouse button and drag the border. To keep the actual ratio of the selection press ALT key, put the mouse over the border line of the side you want modify and press the left mouse button. Hold left mouse button and drag the border. To change the position of the selection press CTRL key, press and hold the left mouse button inside the area. The mouse pointer changes to a cross of thin arrows. Drag the mouse until the outline has reached the new position you want and release the mouse button. Press OK button to crop the image and display cropped image in a new tab page.